In playing the lottery, it seems that luck smiles on those who keep playing. At least that is true in the case of Erek Larson. 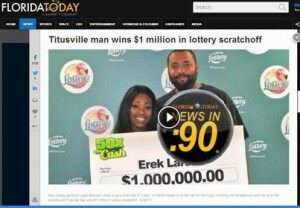 Larson had earlier stopped at Nidy’s Grocery store in Titusville to cash lottery winnings of just $25, part of which he used to buy a new 50x The Cash instant ticket. He did not scratch the ticket that instant, and decided to just head home. It was at home where he discovered that his ticket had won a $1 million prize. Larson later decided to take a one-time payment of $740,432.97, which he plans to use to travel, expand his lawn care business, and share with his mother. He already knows this Christmas will be extra special.